Dan Chu, a student from Boston, talks about Boston Public Schools’ use of student surveys to gauge teacher effectiveness. Two citywide youth groups packed CPS headquarters Tuesday afternoon to ask the district to incorporate student surveys into teacher evaluation. “We are the ones in the classroom, and we are the ones impacted by the quality of the teachers,” said Timothy Anderson, a student at Gage Park High School and a member of Voices of Youth in Chicago Education. 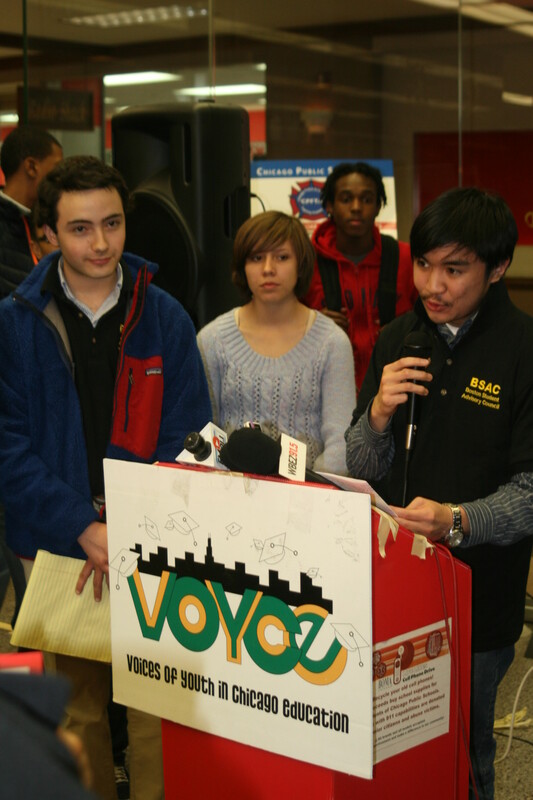 VOYCE joined with students from the Mikva Challenge, an organization dedicated to youth civic engagement, in making their request. District officials responded that they “fully support” getting student feedback in the evaluation process. District spokeswoman Robyn Ziegler said that the idea is based in research, which shows that student surveys are reliable, at least when done by the same group of students over time. It can “deliver consistent information regarding teachers that [has] a very strong correlation to student growth,” she said. The issue of teacher evaluation is a hot one at the moment. CPS and union officials are in the process of negotiating the details of the teacher evaluation process. A state law calls for teacher evaluation to be revamped statewide. Because CPS must implement the new evaluation at 300 schools this September, it is expected that they will soon announce details so that they can train principals and other evaluators on how to use it. The union and CPS started talking about the evaluations in December. By law, after negotiating with CTU for 90 days, CPS can impose its own teacher evaluation scheme at any time. Recently passed state rules dictate that a quarter of the evaluation be tied to student growth measures in the first year. In the second year, student growth measures must count for 30 percent of the evaluation. CPS and the union are hashing out how the student growth measure will look. The district can use value-added state standardized test scores solely, or can use a combination of assessments, including ones designed by teachers or the district. The students at the press conference Tuesday said they did not agree with using value-added measures of student growth. They also do not want student surveys used until after a two-year pilot process. The Chicago Teachers Union is in agreement with them on both counts. “We would like to see how that feedback [from students] would look, and that’s why we support a pilot… we would like to see the results of the pilot and then make a decision based on that,” says Carol Caref, coordinator of the Chicago Teachers Union’s Quest Center. Caref said that value-added measures are unreliable, and that their implementation has been rushed. On Monday, a group of academics announced they were sending a letter to CPS and city officials detailing the problems with those measurements. The district must decide not only how much of a teacher’s rating depends on value-added scores, but also what scores will constitute the top and bottom ends of the scale. In addition to deciding the details of student growth measurement, the union and CPS officials are negotiating over the framework for teacher observation to be used in evaluation. District officials have said they can’t comment on ongoing negotiations. Caref says CTU is in favor of using Charlotte Danielson’s Framework for Teaching, a framework that has been found to be a reliable measure of good teaching. Caref says, however, that the district and CPS have no formal agreement yet. , CPS also developed and piloted its own framework, known as “Teaching for Learning,” last school year.